• Do I Need A Wind Storm Inspection? If your house was permitted after February 28, 2002 your house was required by code to have double wrap hurricane strapping to hold down your roof. Even though your roof maybe older than that it still may have the best of building codes and that is where my company comes into action. We will go into the attic to see whether you have double wrap straps, single wrap straps, clips or toe nail tie downs, then inspect the nails used to hold down your shingles. 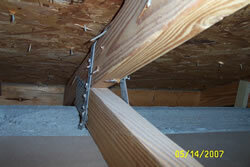 We check the underlayment which is the normal felt or thin rubber sheets that is under the shingles. The style of your roof could save you money. Your roof shape is very important during a heavy wind storm because of the angle the wind the wind hits the roof. A hip style roof has a shape that angles down on all sides and the wind has a hard time getting under the shingles to peal them off. All Key West Style roofs are hip shaped. The new construction of shingles is much better how since the stricter codes were implemented after Hurricane Andrew hit Florida in August 1992. The new Architect dimensional asphalt shingles are guaranteed to take winds upwards of 110 miles per hour. During the high wind storms here in Pasco County in 2004, I personally never saw a failure on this type of shingle. 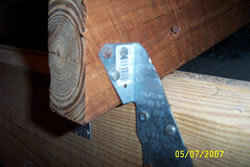 The new code states that the shingles be attached with 8 penny size nail and not the staples. This is another point observed and noted during the inspection. Most all of the insurance carriers in Florida offer some type of reduction for wind or storm mitigation. Some companies will give you a reduction for storm shutters or wood panels that have pre-cut for your windows. Even the 7 mill window film on your windows can reduce the cost of the policy. You could already have several deductions in place and all you need to do is get the affidavit and have a certified inspector fill it out and your agent can apply for a reduction. In most cases if your roof was built or replaced on or after January 1, 2002 your roof would qualify for a reduction in premium submitting the proper form to your insurance company. We can perform a Wind Storm Inspection for a mere $150.00! Combine that with a 4 Point inspection for just $175.00! See our Rates page for a list of our services and rates. There are no ways around it. In order to know ALL of the issues you may face when purchasing the biggest investment you will probably ever make in your lifetime, you need to hire a home inspector. If you live in Florida, you are surrounded by water and face some of the world’s most fierce storms. The hurricane seasons bring really heavy rains and strong winds. These storms affect everyone and cause damage to homes. That damage can be just the beginning. • Need Quick Turn Around? 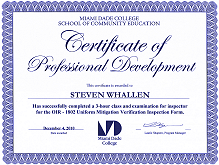 If you need a quick turn around on your home inspection, we are for you. Your report is printed immediately upon the conclusion of the inspection...including photos!